8th Row. 1 s c in each s c, ch 31, turn, work 1 s c in 2nd st from hook and 1 s c in each ch and s c, omitting the last s c.
10th Row. 1 s c in each s c.
11th Row. Decrease 1 s c at end of row and work 1 row even. 13th Row. Decrease 1 s c at end of row and work 2 rows even. 16th Row. Work 2 s c in last s c and work 4 rows even. 21st Row. 1 s c in each s c, ch 9 for head, turn, 8 s c on ch and 1 s c in each s c. Work 1 row even. 24th Row. Decrease 1 s c at end of row and work 6 rows even. Next Row. Begin tail. Work back on 10 sts and work 4 more rows even. 6th Row. Decrease 1 s c at end of row and work 3 rows even. Next 5 rows decrease 1 s c at end of row, break yarn. HIND LEG. Join Wool at end of work, working over 16 sts, work 2 rows of s c.
3rd Row. Decrease 1 s c at end of row and work one row even. Repeat 3rd and 4th rows twice, break yarn. HEAD. Join yarn at 12th s c from tail and work 1 s c in each remaining s c.
2nd Row. Decrease 1 s c at back of head and work 1 row even. Repeat 2nd and 3rd rows twice. 8th Row. Decrease 1 s c at neck. 9th to 12th Rows. Decrease 1 s c at end of row and work 1 row even. 14th Row. Decrease 1 s c at end of row, break yarn and work other side to correspond. Work 2 sections following the 1st 11 rows given and work hind leg following directions given for hind leg. Diamond section for throat and mouth. Ch 2, 1 s c in 1 st ch. 2nd Row. 2 s c in each s c and work 3 rows even. 6th & 7th Rows. Increase 1 s c in 1st and last s c and work 1 row even. 9th Row. Increase 1 s c in 1st and last s c and work 1 row even. 11th Row same as 9th row. Next row begin decreasing 1 s c at end of each row until 1 s c remains. EARS. Ch 12 and work 7 rows of s c. Next 9 rows decrease 1 s c at end of each row. Sew or crochet the sections together leaving opening at bottom for filling. To set in the diamond section for throat and mouth begin at the 1st decrease at front of head and work down. 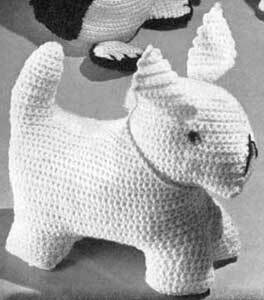 Fill dog with cotton, close opening and sew ears in position. Embroider the nose in Brown and the nostrils in Red. The eyes are outlined in Tan with a Brown French Knot in the center. This dog may also be made in "Dawn" Knitting Worsted. White or Colors.